Not authorized for purchase by the Clerk craft. One Serious Boot! 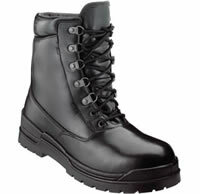 Rocky Boots spared no expense when they designed the Postal Certified Eliminator boot. With its Gore-Tex lining and Thinsulate Insulation this boot is made to tackle the harshest conditions faced by letter carriers, while keeping feet warm and dry in the process. Very disappointed with this boot. Apparently the model for this boot had really fat ankles because even with the laces drawn tight the boot is not close to snug around my ankles. Even tried different sizes and widths but no help. The laces the boot comes with are very cheap too.